Zimbabwean President Robert Mugabe has allocated key ministries to his own party - in defiance of a power-sharing deal, reports say. South Africa's former President Thabo Mbeki was invited back after a meeting on Friday between Mr Mugabe, MDC leader Morgan Tsvangirai and MDC splinter group head Arthur Mutambara. On Saturday, Zanu-PF said a list of ministries had been agreed by all the parties. Bright Matonga, Zanu-PF's deputy information minister in the previous cabinet, told the BBC the allocation was very fair. Zanu-PF takes 14 ministries and 16 are allocated to the two factions of the MDC, he said. Mr Matonga said the post of finance minister had yet to be decided. But MDC spokesman Nelson Chamisa said: "This is Zanu-PF's arrogant wish list that puts the whole deal into jeopardy. It is unilateral, contemptuous and outrageous. "Just yesterday we agreed to call in the facilitator Thabo Mbeki because there was a deadlock. The MDC totally and absolutely rejects this nonsense." One of the MDC's key expectations was that it would get control of the police if Zanu-PF controlled the army. 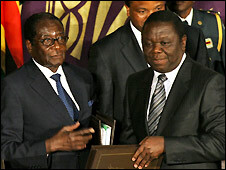 Under the deal Mr Mugabe remains president while Mr Tsvangirai becomes prime minister. But the deal has so far failed to ease the country's crippling economic crisis. On Thursday, it was announced that Zimbabwe's annual inflation rate had soared to 231,000,000%. Meanwhile, the UN says it needs $140m for food aid over the next six months. Critics of Mr Mugabe say he triggered the economic crisis when he began seizing white-owned farms for land redistribution ahead of parliamentary elections in 2000. But Mr Mugabe blames Western sanctions which target him and his chief supporters for wrecking Zimbabwe's economy. The crisis worsened after disputed elections earlier this year. Mr Tsvangirai gained more votes than Mr Mugabe in March's polls, but not enough for outright victory. He pulled out of a run-off in June, accusing Zanu-PF militia and the army of organising attacks on its supporters which left some 200 people dead.